There's more than one way to skin a (hot) dog, including toppings, buns, preparation methods and more. 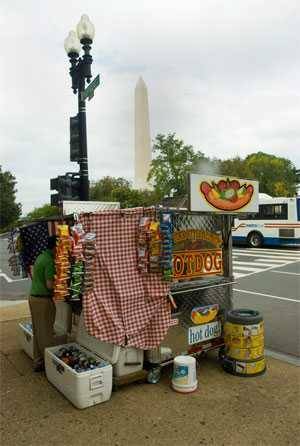 The story of our national food, the American Hot Dog, is the story of The American Dream. It starts at Ellis Island with waves of immigrants in the late 1800s and moves to Manhattan where European sausage makers, many of them Jews, brought their skills and recipes and started life on a shoestring selling Frankfurt and Vienna sausages on street corners and in butcher shops. Waves of Greek and Macedonian immigrants also appeared on our shores. On rare days off they took their families to Coney Island, the great seaside amusement park about 15 miles south of Midtown Manhattan. There they tasted the Coney Island version of the hot dog and fell in love with it. As they migrated west, many set up shop on street corners, developed their signature recipe, and with hard work and ingenuity opened a restaurant, then a small chain, and made a good living for themselves and their families. For them, Jews and Greeks especially, the American Hot Dog became The American Dream. 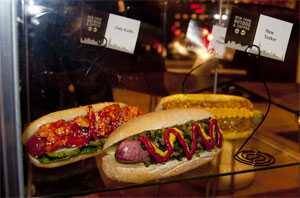 Although there are scores of recipes for cooking and dressing frankfurters, and hundreds of hole-in-the-wall hot dog stands have earned life-long followers with their unique house concoctions, many cities and regions have evolved a local design that has become their signature breed of dog. It has become part of their culture and the populace cannot stand to eat them any other way. For them the unique scent and taste of their tribal genre conjures powerful memories of home and childhood. They are devoted, even addicted, to their hometown dogs. This may be one reason why no national chain has been as successful as the national hamburger chains. Since it all started on Coney Island, that's where we start our road trip. Today, Nathan's Famous, founded in 1916 by Polish immigrant Nathan Handwerker, reigns over Coney Island and sets the standard for the New York Hot Dog: An all-beef frank wrapped with a snappy natural casing, cooked on a shiny flatiron griddle, and most often dressed with spicy brown mustard, sauerkraut, and griddled onions. That's all. No relish, chili, and especially, no ketchup. They offer other stuff if you want it, but a purist orders only mustard, kraut, and onions. Just up the Parkway and across the Brooklyn Bridge, about 10 miles away, we arrive in Manhattan where Sabrett franks are the iconographic streetcart food. 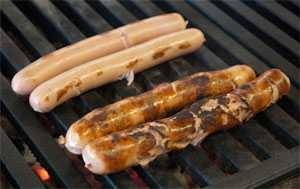 Sabretts are a garlicy all-beef frank in natural casing often simmered in hot water, a "dirty water dog", so named because the water becomes murky with flavor extracted from the sausages. It is served with mustard and sauerkraut, like Nathan's, but Sabretts have a sweet-tart sauce loaded with onions. If you've had a hot dog in Manhattan with onion sauce, chances are you've had Sabrett's Prepared Onions. Click here for a recipe for a similar onion sauce. Like the rivalry between the Yankees vs. Mets, the Giants vs. Jets, Nathan's vs. Sabrett can start a fight. Continuing north about 160 miles to Providence we find a dozen or more joints in Rhode Island that specialize in what they call New York System Hot Wieners, which are to hot dogs what sliders are to hamburgers, and, like sliders, they are often called belly busters. Named to honor the iconic New York hot dog by Greek immigrants, they are short skinny skinless orange pork wieners. Note that some places spell it Wieners (the normal spelling since the word is derived from Vienna), and some spell it Weiners. The better short order cooks assemble the final product in an acrobatic show called "up d'ahm" frowned upon by the health department: They hold one arm out, line as many as a dozen buns from finger tips to shoulder, squeeze in the wiener (don't call it a hot dog), hit it with yellow mustard, spoon on the meat sauce (don't call it chili), place on chopped onions, and dust with celery salt. And it happens fast. At right, that's Chuck Mooney, a cook at Original New York System Hot Weiners at 424 Smith St. in Providence, founded in 1927. The meat sauce is, as are so many others across the nation, a Greek immigrant innovation, greasy, slightly runny, and tinged with American chili powder, allspice, cloves, and nutmeg. The drink of choice is coffee milk, which is cold milk darkened with a sweet coffee syrup, named the official state drink in 1993. You can make Hot Whatevers at home by ordering the spice mix from another RI fave, Olneyville. You can even order the same franks used at Olneyville from Little Rhody Brand Frankfurts. Now repeat after me "Six all dah way. Up d'ahm. Don't forget da celery salt on dem. Coffee milk on dah side." Moving south along the north shore of Long Island Sound on I-95 we enter Texas Wiener country. We pass a few stands in Connecticut, and there are outposts extending through the lower Hudson Valley, but the greatest concentration is around Paterson, NJ, just a mustard squirt west of Midtown Manhattan. In Paterson they are deep fried beef hot dogs topped with spicy mustard, chopped onions, and a variation on the ubiquitous Greek flavored ground meat "chili" sauce that has migrated across the nation. The breed extends as far south as Philadelphia, PA. They probably got the name Texas Wiener because the meat topping had no beans and somehow resembled Texas chili. Not. New Jersey has more hot dog variations than any state. They are either confused or just reflecting their multinational heritage. 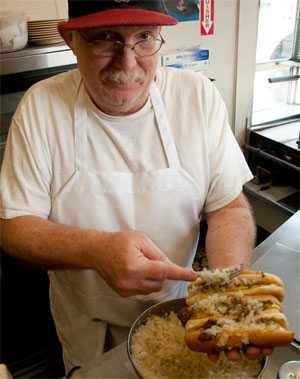 There are perhaps a dozen joints in North Jersey that serve what may be the nation's most unusual prep, the Italian Dog. This pup is griddled or deep fried and nestled into a bread boat that looks like a half a giant thick pita, topped with sautéd onions and sweet peppers as well as deep fried potato disks, mustard optional. Pointing northwest, in Rochester, NY on Lake Ontario, hot dogs are called "hots", and although there are several first rate producers, Zweigle's is the signature frank of this upstate city. Made from pork in a natural casing, the Zweigle White Hot is neither cured nor smoked, and the result is cream color, plump, and spicy. Zweigle also makes a standard colored frank. 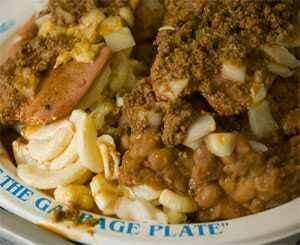 But the real innovation in Rochester is the sloppy mess called the Garbage Plate. In 1918 Alex Tahou, a Greek immigrant, opened a hot dog stand in Rochester. During the Depression he started dishing out "hots and potats", a dish of hot dogs, baked beans and home fried potatoes. His son, Nick, took his Dad's idea and went crazy. He divided a big paper plate into thirds: One third got covered with smushed baked beans, one third with home fries, and one third with macaroni salad. Then he took two fat hot dogs, split them lengthwise, cooked them on a griddle until they got nice dark crispy char marks on them, and nestled them onto the tri-colored pillow of beans, potatoes, and 'ronies. On top he swabbed Dijon-style mustard, sprinkled chopped raw onions on the mustard, and buried the whole thing under a peppery, lard laced ground beef sauce with a kick of cinnamon. Nick Tahou's now has two locations, including one in an old train station across the street from the original 1918 location, and his Garbage Plate has become so popular there are more than 50 restaurants around the area serving variations on the theme. As we motor into the South, many hot dog stands offer coleslaw as a topping. Mounted with the optional topping, the final product is commonly called a slaw dog. In much of West Virginia the slaw is required. The classic WV Slaw Dog is a tasty but improbable construct of bun with a beanless ground beef sauce sometimes forming a bed for the frank, sometimes forming a blanket on top (they insist it is a meat sauce and it is not to be called a chili sauce), yellow mustard, and finely chopped creamy sweat-sour coleslaw crowning it. Before you stick your finger down your throat, think of it as a New York Dog with a different form of cabbage replacing the sauerkraut. It is really surprisingly good, especially the contrast of hot and cold. Similar slawdogs can be found from Alabama through Georgia into South Carolina and North Carolina (where the slaw is dressed with a wierd mix of ketchup, hot pepper, and lots of vinegar). What we have here is a cheap well rounded meal with two kinds of meat, veggies, and starch, all in one hand. Or two. Click here for a the West Virginia Slawdog recipe. It is a short ride west to Cincinnati, where, in 1922 Tom Kiradjieff and his brother John, Macedonian immigrants, opened the Empress, a restaurant where they sold Greek food and hot dogs. But Cincinnati was German and business was bad. So he took his signature Greek lamb stew laced with cinnamon and cloves, switched to ground beef, added hot peppers and other spices, called it chili, and served it over spaghetti and hot dogs. It was a hit. Nobody knows if naming hot dogs "Coneys" was homage to the amusement park on Long Island, or if the name came from the other Coney Island amusement park, the one built in Cincinnati in 1886. And nobody knows who had the bright idea of topping it with a huge mound of shredded cheddar cheese, but that's the Cincinnati Cheese Coney that is served all over town and at the ballparks: A pork and beef frank with a natural casing topped with mustard, then chili, then chopped onions, and an ungodly amount of shredded cheese mounded on top. 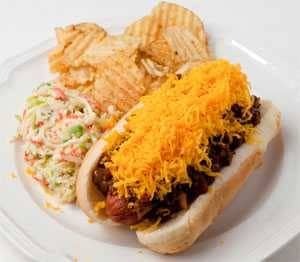 Click here for a recipe for the a Cincinnati Cheese Coney. It's a straight shot up I-75 about 250 miles to Detroit where we find a hot dog with heart. Literally. Beef heart. The first Detroit Coney Dog was created by a Greek sheepherder, Constantine "Gust" Keros in 1917. Soon after clearing Ellis Island he went to Coney Island and tasted a hot dog. Then he went to Detroit to seek his fortune on the auto assembly line. He didn't speak English, so he swept floors until he could afford a popcorn cart, and eventually he opened American Coney Island where he served hot dogs just like the one he tasted on Coney Island. Legend has it that one day a customer asked him to ladle some of his homemade chili onto the hot dog, and the rest is history. The prototypic Detroit Coney Dog is a skinless beef frank from Koegel. It is top loaded with mustard, then the chili made mostly from beef hearts, no beans allowed, and crowned with chopped onions. It is served all around the state in restaurants called Coney Islands. If you are in Detroit, check out the original American Coney Island founded by Gust and Lafayette Coney Island founded by his brother, both in downtown Detroit, right next door to each other. If you stand out front looking like you're trying to make up your mind, the staff of one or the other may come out and drag you in. When you order, to get the real deal, make like a Buddhist monk and ask for "one with everything". Most Coney Islands have their own recipe for the chili. Since Gust and many other Coney owners were Greek or Macedonian, theirs has an unmistakable Old World flair to the recipes, with things like cinnamon and oregano. The photo here is Walt's in Waterford, my favorite. Continue up I-75 about 60 miles for a variation on the Detroit Coney, the Flint Coney. The meat sauce is less pasty and more crumbly since some of it is ground hot dogs. Oh the ignominy! Click here for a recipe for the classic Detroit Coney and more photos of Walt's. An easy 270 mile drive west takes us along the south shore of Lake Michigan to Chicago, for the most elaborate hot dog of them all. There is only one recipe for the Classics Chicago Dog, and little variation is tolerated in the huge city and its surrounds. The Chicago Hot Dog is so popular the newspaper estimates there are 1,800 hot dog stands in the area, far more than all the McDonald's, Burger Kings, and Wendy's combined. What makes the Chicago Hot Dog special? Like Chicago's famous architecture, it is great design. It is a juicy, crunchy, sloppy combo that leaves your fingers fragrant for hours: A garlicy all-beef frankfurter, usually Vienna Beef brand, with a natural casing, simmered in hot water, never boiled, on a Rosen's bun studded with poppy seeds and topped with solar yellow mustard, kryptonite green sweet pickle relish, pungent chopped raw onion, juicy tomato slices, spicy hot "sport" peppers, a crunchy salty kosher pickle spear, and a sprinkle of magic dust: celery salt. The result is a sandwich with so much vegetation that it is called a "garden on a bun". While you're in Chicago, it would be a shame to leave town without trying a Polie, the local version of the Polish Kielbasa. It is said that there are more Poles in Chicago than any city except Warsaw. Polies, or Polish sausages, are a fat coarsely spicy ground smoked pork and beef link griddled until crunchy and served on a bun with griddled onions and mustard sold at most hot dog stands. If you're still hungry, why not fill the hole with an Italian sausage sandwich, an uncured coarsely ground pork sausages in natural casing, flavored with fennel and crushed red chili peppers for some heat. They're served in hundreds of "Italian Beef stands" on a crusty bun with sautéd sweet peppers and onions, occasionally with tomato sauce and melted cheese. 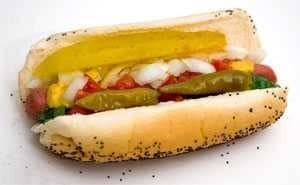 Click here for info about hot dogs in Chicago and the recipe for the Classic Chicago Hot Dog. Click here for reviews of the best hot dog joints in Chicago, my home town (can you tell?). Let's swing back through Chicago and pick up Route 66 along which we can visit some of the nation's most interesting and idiosynchratic hot dog stands, almost every one of them selling corn dogs. Credible arguments are be made that the the frank on a stick with an integrated sweet and crunchy fried cornmeal jacket was invented in Texas, Oklahoma, and Minnesota in the early 1940s. Or was it as far back as 1929? 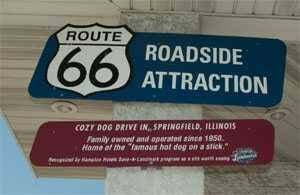 The Cozy Dog Drive In in Springfield, IL, may have been selling them longer than anyone, since 1946, and the Iowa State Fair may be the place where they really caught on. There's a national chain called Hot Dog on a Stick whose schtick is pretty girls dressed in brightly striped hats. They have also been around since 1946. By now corn dogs have become so popular that they can be found in every corner of the country and even in the freezer cases of most groceries, so it is hard to call this a regional style. But I'll gladly have one at every meal as we drive 1,900 miles across the Great Plains heading for Arizona. Folks in Bozeman, MT, live in a beautiful valley surrounded by mountains and parks and they celebrate their brief summer with the annual Sweet Pea Festival of the Arts in early August. They sing, dance, parade, buy arts and crafts, and rejoice in their unique hot dog prep, the Tater-Pig, sold by the Chord Rustlers barbershop quartet since the 1970s. A hole is bored through the center of a potato and a pork sausage is squiggled into the hole. The two are baked together and served under sour cream, chives, and bacon bits. In nearby Missoula, a competing barbershop group, the Rocky Mountainaires, serve their version of the Tater-Pig at the Western Montana Fair as a fundraiser. That's a combo that will make a hungry person sing. The Sonoran Hot Dog is relatively new, first appearing in the 1960s just across the border in Sonora, Mexico, and spreading north through Tucson to Phoenix. There are now more than 100 hotdogueros in Tucson alone serving this cross between a tamale and hot dog. It starts with a bun that is larger and denser than the typical hot dog bun. A pocket is cut in it and in goes an all-beef frank swaddled with a twist of bacon, then topped with your choice of pinto beans, grilled onions, fresh onions, chopped tomatoes, lettuce, red chile sauce, tomatillo salsa, guacamole, mayo, mustard, ketchup, and shredded yellow cheese. Beans, tomatoes, onion, and a topping of mayo are pretty standard. It is all washed down with Coke from Mexico where it is made with cane sugar not corn syrup. Many of the push carts in Seattle offer their dogs with cream cheese and there is a devoted following although it is surprising how many locals have never heard of the delicacy. The recipes vary from vendor to vendor, but the basic concept is: Griddle a frank, griddle some onions, spread cream cheese on one side of the bun, some Dijon style mustard on the other, nestle the dog on top, and crown with the caramelized onions and sauerkraut. Since this is Seattle, maybe add some jalape–os, grilled cabbage, sriracha, or barbecue sauce. There are dozens of other local specialties around the nation, usually the signature creation of a single restaurant or a regional chain. Here are a few, in no special order. Tell me about the ones I missed. Puka Dog. In Kauai, HI, there's a little hot dog hut where they use a heated spike to poke a puka, a hole, in the center of a bun-sized loaf of bread, then they pour in their signature sauce (garlic, lemon, and pepper), then in goes your choice of seven tropical fruit sauces (pineapple, mango, papaya, coconut, star fruit, guava, or banana), and finally they insert your choice of a spicy Polish sausage or a veggie dog. And, yes, they do have ketchup and mustard to put on your Puka Dog. The Varsity chain based in Atlanta offers pimento cheese as a topping. Some folks swear the pimento cheese chili dog is the best dog in the country. Lum's was a popular national chain that peaked in the 1970s and still has several locations. Kids especially like eating there because the dogs are simmered in beer. Rutt's Hut in Clifton, NJ, deep fries their dogs in veggie oil until the skin rips open. These "Rippers" are crunchy on the outside, chewy near the surface, and tender on the inside, unless you order the "Cremator" that is fried until it is practically black. They are then topped with a mixture of mustard and a tangy secret house made relish made of cabbage, onions, and carrots that the locals rave about. Something Different Cafe is a combo cafe and country store near Urbana, VA, and Dan Gill is a creative chef with serious cooking chops well known for his Southern barbecue and down home dishes. His "Applechain", a pun on Appalachian, is a quarter-pound Kosher all-beef hot dog in a "snuggle-bun" (half of a partially hollowed homemade sub roll) nestled on a bed of artisinal copper kettle apple butter and topped with mustard. Hey, if honey mustard can work, why not apple mustard? Ted's Hot Dogs in Tonawanda, NY, near Buffalo, founded in 1927, grills their Sahlen's brand franks to a char over charcoal (photo at right) and tops them with a superb hot sauce. It is served with Aunt Rosie's Loganberry juice. Flo's in Cape Neddick, ME, serves only hot dogs. In this tiny low ceilinged shack they serve small pork franks, just larger than cocktail wieners, on spongy buns with a homemade special hot onion relish that the locals love. No menu. They just ask you "how many?" You can have mayo or mustard with the hot sauce. Hot Dog Annie's in Leicester, MA, serves their franks with sweet tomato based barbecue sauce with chunks of onion. Idaho Potato Dog. I've heard that in Boise there's a place that serves potatoes dipped in BBQ sauce on their dogs. The Francheesie, sold at several joints in Chicago, is split down the middle, stuffed with cheddar cheese, wrapped in bacon, and deep fried. Where did such an outlandish idea come from? 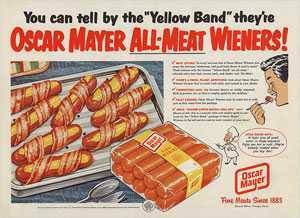 Oscar Mayer, perhaps? Be sure to check out our recipe here. M.K. Davis Restaurant in San Antonio serves a Crispy Dog, split down the middle, filled with cheese, wrapped in corn tortilla, and then deep fried. The Lincoln Log Sandwich. In New Jersey there is the Lincoln Log Sandwich immortalized by Carmella Soprano on one of the last segments of The Sopranos. The Lincoln Log Sandwich is a boiled frank slit open lengthwise but still hinged on one side, with a schmear of cream cheese down the middle, served on a bun or a slice of white bread, sometimes toasted. I'm not aware of any restaurants that serve Lincoln Logs, but I've read of a lot of people who remember their Moms making them. Fenway Franks. What can a Chicagoan like me say about Fenway Franks served at Boston's iconic baseball park? For many years they served Ballpark Franks, but in 2009 they switched to skinless beef franks made by Kayem, and they are typically dirty water dogs served on a goofy bun that looks like two small slices of white bread glued together at the bottom (which, as their saving grace, can be toasted on the griddle), and topped with pickle relish, mustard, and ketchup with guacamole as an option? As they are quick to remind Cubs fans, at least you can get them in October. Ben's Chili Bowl in DC serves the Half-Smoke, a lightly smoked spicy beef and pork sausage, split and griddled, with mustard, onions, and swimming in one of their famous chili blends. It tastes like a wonderful cross between a coarse ground hot dog, a kielbasa, and a Polie and is custom made for them by a local German sausage maker. Founded in 1958, this U Street institution is a must when visiting the nation's capital. During the riots in 1968 after the assination of Martin Luther King, the predominently black neighborhood was looted, ransacked, and burned. The local movie theatre and Ben's were the only two buildings left untouched and they fed both the neighborhood peacemakers as well as the cops and firefighters. Ben's has been a popular hangout for politicians and movers and shakers almost since the beginning, and the walls are crammed with photos of them. Among their regulars have been Stokley Charmichael, Duke, Miles, Bessie Smith, Ella, Cab, Nat, Redd, MLK, Roberta Flack, and the Cos, who called it his favorite restaurant and has a dish named after him. Even President Obama has sung its praises. In 2004 The James Beard Foundation Awarded them the American Classic title. You can order Half-Smokes on their website. Dodger Dogs. Dodger Stadium in Los Angeles serves more hot dogs than any other ballpark. To make Dodger Dogs, they start with a "foot long" Farmer John brand pork frankfurter that is really only 10 1/4 " long. Some are steamed and some are grilled, and all the fans argue over which is best. They serve them with your choice of condiments, among them relish, mustard, ketchup, and diced onions soaked in water to take the sting out of them (wimps). According to Ron Smith of Farmer John, "At home, if you want a true Dodger Dog, you can purchase them at [the grocery chain] Smart & Final, boil them until they are thoroughly hot without splitting, then let them blister and burn a little on a grill, or, if you don't have a grill, then just move them carefully from the water into a large frying pan so you don't break them in half, and let those baby's burn. That's right, burn. I love some dark [color] on the outside of them, along with the blistering, of course. That make's all the difference in a hot dog. Batter up, and go for it." Burned pork hot dogs and neutered onions. Aw, jeez, now this is why Cubs fans really hate the Dodgers. Kimchi, Bulgogi, or Dak Kalbi Hot Dogs. A recent addition to the wierdness of Greenwich Village, New York Hot Dog & Coffee is a Korean flavored shop that sells fusion dogs. If we can use kraut, they can use kimchi, a different style of fermented cabbage. If we can add ground beef in sauce, they can add kalbi or bulgogi, marinated beef. Taco Dogs. Several restaurants serve franks in taco shells rather than soft buns. Can't imagine what their napkin bill is like. Nouvelle Hot Dogs. I'm sure it won't surprise anyone that hot dogs have become chic in upscale restaurants, and many have applied their creativity to the format. Not surprisingly San Francisco is a hotspot of the nouvelle hot dog. According to an article in UrbanDaddy.com, there's the Mortadella dog a Boccalone; 15 Romolo serves The Crispy Dog, a grass-fed all-beef frank wrapped in corn tortillas and fried; and Absinthe has a Kobe beef, pork shoulder, and bacon-filled sausage served on a bacon-fat-rubbed bun with house-fermented sauerkraut, Guinness mustard. How many of these styles and restaurants will last is questionable. In all liklihood they are fads. But, as Homer Simpson might say "Mmmmmm, but what a fun fad!" Pigs in a Blanket must be included in any survey of hot dog variants. As any 10 year old knows they are franks wrapped in dough, usually frozen biscuit mix, and baked in the oven until golden. Sometimes the hot dog is split and filled with American cheese. A variation is to pan cook a breakfast sausage and wrap it with a pancake. 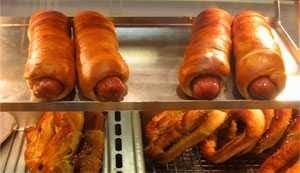 Then there are the Bagel Dog from Einstein's Bagels and the Pretzel Dog at Auntie Annie's (at right). My favorite is from Vesecky's Bakery in Berwyn, IL, near Chicago, where they sell hot dogs wrapped in buttery puffed pastry. In addtition to the variety of dogs across the nation, history records a few defunct greats. Poorman's Meal is a Depression feast made with sliced hot dogs, potatoes, onions, and tomato sauce. Watch this wonderful video above with 91 year old Clara Cannucciari reminiscing and demonstrating how it is made. Hot Dog Stew is another variation on the theme, made like beef stew with frankfurters replacing the beef in a thin bath of potatoes, onions, carrots, green beans, tomato sauce, water, and seasoned with herbs and spices. The Weenie Royale. During World War II more than 100,000 Japanese Americans were forced from their homes and traditions and cuisine and interned in "camps" in the West. They were fed cheap commodities such as Spam, hot dogs, organ meats, and potatoes. After the war "weenies" and ketchup remained in their repertoire, with a twist. A strange mutt, Weenies Royale is still a popular egg dish in Japanese American households, a stir fry of hot dogs sliced on an angle into 1/4" disks, onion, soy sauce, oyster sauce, and eggs served over rice. Bite me! What's in a Hot Dog and How are They Made?